Chopped cucumbers, tomatoes, and crunchy red onions are a classic chopped salad base for a simple vinaigrette and some fresh herbs. But top them off here with some smoked salmon for even more flavor: the fish has an intensity that goes nicely with the vegetables, and the color is striking. 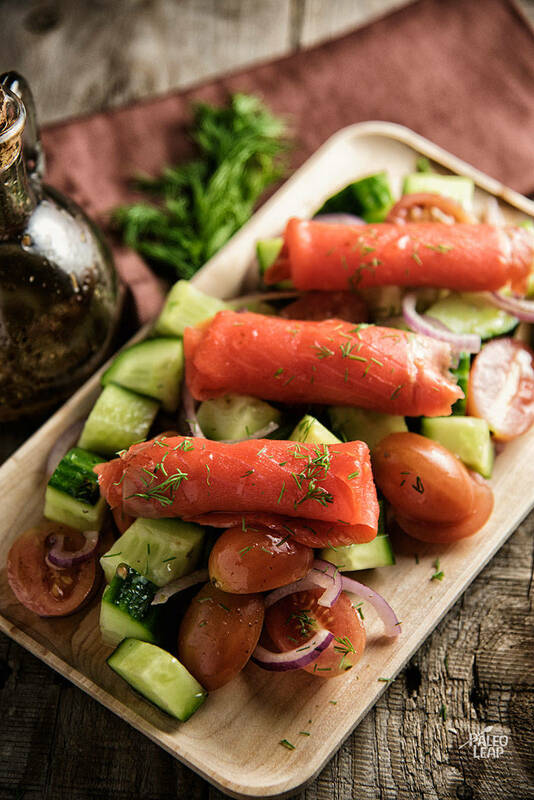 It’s not exactly slacking off nutritionally, either: cucumbers might be mostly water, but the salmon is full of Omega-3 fats and other good stuff, and the olive oil/herb marinade is full of healthy fats and important antioxidants. With all the olive oil, this would be an elegant side dish or appetizer for anything Mediterranean or Middle Eastern. But it would also work as a lighter main course for breakfast or brunch, or as a party tray for something too late for lunch, but too early for dinner. SERVES: 2 PREP: 15 min. In a small bowl, whisk together the olive oil, lemon juice, garlic, balsamic vinegar, and oregano. Season the dressing to taste with salt and freshly ground black pepper. Combine the tomatoes, cucumber, and onion in a bowl. Drizzle the vegetables with the dressing and gently toss. Roll the smoked salmon slices, and place on top of the fresh vegetables. Sprinkle some fresh dill to taste on top before serving.